Waterproof Flooring | Belleville, ILWe have a new 800 number, but you can still call us at 618-234-2915 if you prefer. You don’t want liquids to put a damper on your floor, and we don’t either. That’s why we’re dedicated to providing you with a diverse selection of waterproof flooring in Belleville, IL. We’ve been serving local customers for more than 72 years and have seen what water can do to a floor. Now that’s no longer an issue. By opting for waterproof floors, you choose an easy maintenance material with fewer worries of what could go wrong. Our waterproof flooring installation service simplifies the process even further. We perform all of the work for you by sending our fully equipped crews to your house at a time that’s convenient for you. Whatever floor you choose will be installed by professional hands for an enduring addition to your interior décor. When it comes to waterproof flooring, you don’t need to sacrifice style for quality and protection. Downs H2O is a system of luxury vinyl planks that meets all of your waterproofing and design needs. The material mimics wood, which usually doesn’t work well with water. From elegant dining rooms to whole-home applications, waterproof vinyl planks are a great choice for every taste. 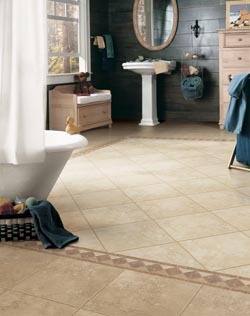 Downs H2O floors are guaranteed to be 100% waterproof and are made for bathrooms, laundry rooms, and kitchens. The abundance of colors and designs allow you to satisfy your aesthetic preferences while opting for one of the most practical floors. Whether there’s a spill or a broken and leaking appliance, it won’t be any problem for you when you have waterproof vinyl flooring. This means you never have to worry about mold, and the watertight seal means that nothing can get into the seams. No dust or dirt, no stains or scratches. A sweep and a mop is all that’s needed for a clean, comfortable, quiet floor. We can install the planks over almost any existing floor with no adhesive, which saves you a lot of money on waterproof flooring installation. The best kind of carpet is the kind that can handle a lot of activity. Our stock of Tigressa H2O is designed to meet that need. This pet-proof material dissipates odors and smoke and is durable despite being low maintenance. The patented 100% thermoplastic commercial-grade backing prevents liquid from soaking into subfloor and padding, providing what’s sure to be a welcome relief for parents and pet owners. Tigressa is known for designing soft, strong, eco-friendly floors, and their waterproof carpet is no exception. We have them available in plenty of styles and colors so customers can receive the quality they expect in any fashion they like. From versatile neutral colors and textures that are suitable for almost any style to vivid colors and patterns that add excitement and taste to any room, we’re sure to have the perfect style of waterproof carpet for your home. In addition to standing up to water and moisture, waterproof carpeting is also a great idea for homes that have children, pets, or lots of foot traffic. Because these carpets are designed to withstand the damaging effects of water, they’re also incredibly resilient in general, standing up to rambunctious children, pets’ claws, and high levels of foot traffic. Whether you choose our waterproof carpets for the busy family room or a child’s bedroom, you’re sure to be thankful for your smart purchase. Once you’ve chosen your ideal flooring materials for any room of your house, allow us to provide expert waterproof flooring installation. While waterproof vinyl can often be installed over existing floors, sometimes you need to remove the old flooring. Our contractors will properly and completely remove your old floors, prep the subfloor, and install your new flooring so that it looks and functions great for many long years. Whether it’s waterproof luxury vinyl planks, carpet, or any other material, we take the time to make sure your floors are installed properly. In fact, by leaving your installation to us, you’re covered by our lifetime installation guarantee. Any floors installed by our team are covered forever from any installation-related issues. If you experience installation issues, even a decade or more down the road, we’ll make it right at no expense to you. Get in touch with us to schedule affordable and easy waterproof flooring installation with a professional. Contact us today to discuss our waterproof flooring selection. We proudly serve clients in Belleville, Illinois, and the surrounding area.